On March 10, 2019 I was Groundskeeper for a game of Bluebeard’s Bride in the Shinchon area. The game is based on the fairytale of the famous serial black widower Bluebeard, but as you can tell from the title this game focuses on the bride who married him. I personally think of it as a work of feminist horror that focuses on the violence, helplessness, and horror felt by women in partriarchy. Also the book is fricking gorgeous?? So there we were, five women gathered in a room on a fine Sunday. The first question I got going in was, we have four players. How many Brides are there? The answer: One! Each player plays not a different bride but an aspect of her, called a Sister. The Sisters control the Bride’s actions based on their control of her wedding ring, and Sisters who do not currently hold the ring can also speak and act to an extent. In fact some of the best fun in the game was the Sisters’ increasingly anxious speculations about whether they can trust Bluebeard, and whether the strange happenings in the mansion were due to his crimes or the faithlessness of the other brides. I found this an innovative and enjoyable approach to having a single-protagonist adventure with multiple players, not to mention a sparkling examination of the female protagonist’s inner life. This is the single easiest way I know to explain the concept of the Sisters. Carl Jung who? Female archetypes what? It’s Inside Out with a grown woman, complete with five temperamental sprites living in your head! No one has just one thought or emotion all the time, right? Much like IO, Bluebeard’s Bride employs a lively narrative device to express the complexity in all of us. The Sisters, who each express an aspect of the Bride’s self, have relationships and stories of their own that builds up their characters and spices up the game. For instance, the Virgin (the Bride’s naïvete and love of freedom), played by Mwai-jjeong, disliked Ego’s Fatale (the Bride’s sensuality and her will to dominate) because the Fatale would make lewd jokes whenever the Bride got drunk, bringing down her reputation. (I guess we know why she had to look outside the village for a husband, eh?) The Fatale in turn thinks the Mother (the caring but also authoritarian aspect of the Bride), played by Arbonne, is too rigid in her morality and needs to learn the art of manipulating people. Each Sister also added more depth to the relationship between Bluebeard and the Bride during the Wedding Preparation phase. The Virgin was moved by Bluebeard’s gesture of picking wildflowers and clumsily weaving a garland for her. The Witch (the Bride’s supernatural and feminine power) played by Starfire fell for him when the nobleman took off his fancy shirt to help her family’s farmwork. A gander at his half-naked body didn’t hurt, either. I especially loved this look into the more human sides of Bluebeard that helped bring home how a serial murderer of women could charm so many of them into marrying him, though his fortune certainly helped of course. The Wedding Preparation is also a golden opportunity for Groundskeepers like me because the players are sitting there and telling us how to torment and scare their characters. With Bluebeard’s Bride, which does not take to advance preparation and where improvisation is (ahem) key, the notes taken during this step help guide and shape the Groundskeeper’s creativity. First, I referenced the Room Threats from the book to outline themes by each Sister. I also took note of images from the chargen process that left an impression on me and seemed to suggest further conflict. I wasn’t able to use everything I wrote down and had additional inspiration from outside my notes, but getting down even these fragmented impressions helped me organize my thoughts and gave me ideas for images and motifs to use during play. These notes also make me wistful, by the way, because I could have done so much more to mess up the Sisters. You know the story of Bluebeard, right? Sketchy rich guy plagued by rumors about his mysteriously disappeared wives. He hands the keys of his palatial mansion to his newest innocent bride and gives her free run of the house except for one room. Then he is urgently called away and forced to travel before the newlyweds can even consummate their marriage. The play begins with the Bride at home, after her groom has ridden away. Once a Sister gives a description of a key, the Groundskeeper describes a room based on the key. I linked the key to Religion, one of the Mother’s motifs, to come up with an old chapel. Since the Mother missed the chickens she had to leave behind to marry Bluebeard, I further linked this place to the threat of Motherhood > Sacrifice to make it about a mother who had her children stripped from her by Bluebeard. In the chapel, where golden sunlight spills through stained glass, the Bride meets a crying maidservant who weeps and prays before the altar to get her children back. The Bride witnesses horrible bloodshed when the glued-together remains of small children’s ashes and bones fall upon a priest, tearing him apart. She is forced to doubt her own perceptions, however, when the priest she just saw die emerges from the confessional as though nothing had happened. After trying to console the weeping maid and kicking away the ash-children who tried to climb up her legs, she tells herself Bluebeard didn’t take anyone’s child away–he was just taking care of children who had no one else to turn to. She takes the gold brocade behind the altar as a token of Faithfulness. It is pure blasphemy for a wife to cast aspersions on her husband, after all. That faith is challenged in the very next room. A pretty key adorned with pink flowers opens a glass hothouse filled with the very wildflowers that Bluebeard had picked for her, drawing cries of admiration from our bride. The Virgin instantly sets herself to weaving a garland for her hair from the blooms, improved to be more vivid and fragrant than the wild ones that grew behind her house. At that moment a woman rises up from a shallow grave mere feet away, the flowers wrapped around her body and growing out of her eyes. She harangues the Bride, saying women must be perfect flowers of silence and obedience; the Bride’s cries turn to screams of horror. The garland she has woven into her hair dig roots into her scalp, and frantically tearing them out leaves her bleeding. The Bride turns the flower woman’s attention to another victim and escapes, but her mind is filled with doubt. 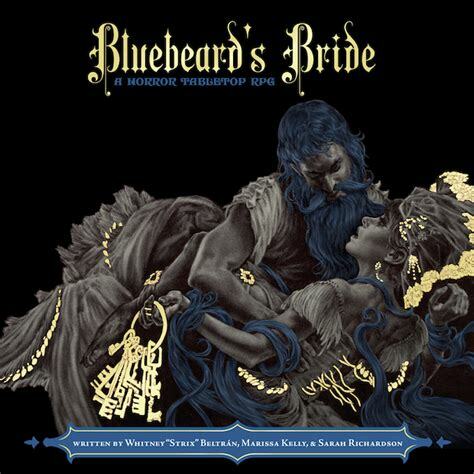 Was the woman a former bride of Bluebeard? What happened to her? The next room is a woodcrafting workshop opened with a wooden key, and the Bride is frightened to find yet more strange children made half of wood. When the carpenter tells the children to “Go to your mother” they go and cleave to a grotesque wooden form in the corner, and the Sisters tell each other that Bluebeard must have been tricked by a monstrous wood woman into having strange children with her. The Mother puts the rest at ease, telling them such misfortune does not befall a woman of worth. The Virgin tells herself that she is more beautiful than any flower, and will make Bluebeard happy unlike the prior women. The Fatale, formerly suspicious of Bluebeard, actually feels herself eased by the evidence of a former wife. It’s the Witch who feels new suspicions spring up, but the other three won’t listen and the Bride reaffirms her Faithfulness to Bluebeard. When the Sisters open a beautifully crafted and bejeweled door whose lock fits a sparkling silver key, a room full of jewelry greets the Bride with its splendors, overwhelming her with her bridegroom’s wealth and his love for her. The moment the Fatale tries on a diamond necklace, however, the Bride falls over from its crushing weight, and the Sisters are overcome with the visions of the many women who wore the same necklace and how they died. The Virgin tries to tear it off but only succeeds in cutting her hand. The Bride crawls from the room, staggering under the weight of lives and blood and the conviction that Bluebeard killed his brides. As soon as she makes it outside the door the diamonds shatter like glass, the unnatural weight disappearing with them. This, hilariously enough, was the moment the Mother and Virgin turned away from Bluebeard for good. “He gave us fake diamonds? !” We all burst out laughing at that. Murder is one thing, but fake jewelry is absolutely unforgivable. You know? With two tokens of Faithfulness and two of Disloyalty, the Bride is torn between belief in and suspicion of Bluebeard. A search for the door opened by the night-black lacquered key that the Witch is drawn to leads them to a basement the Bride didn’t know existed, one enveloped in a darkness so deep it stifles the light of her candle. There is light in this darkness, however. Wherever the Bride stepps the wildflawers from home, the same flowers Bluebeared once plucked for her, spark with illumination to light her way. They aren’t the “improved” variation that overwhelmed her with its scent in the hothouse but the small, unassuming blossoms she remembered from home, each a tiny but clear point of light. She finds them at the center of the room, not the lurid litany of beauty and death that was etched across her mind in the jewelry room, but sad and shy shadows in the darkness. They ask the Bride, Adeline (that is what the players decided to call her), to stay: It’s comfortable and safe here, they say. Don’t return to the world of men that took their lives so cruelly. Adeline, however, says no. She won’t hide from the sun like that. She will take the evidence to the town and stop Bluebeard. She consoles them in turn, telling them they can be brave no matter how hard and scary things are. When she has gone around the circle of grieving women she finds herself back aboveground, in front of the house. She turns her back on Bluebeard’s mansion and goes home, holding gold brocade, flower petals, broken glass, a block of wood, and a small clump of wildflowers. Did the villagers believe Adeline when she came home alone a mere day after her wedding, her wedding dress torn and bloody, claiming her rich husband is a murderer and holding out a small pile of knick-knacks as proof? Would you have believed her? I think the important thing is that she went from ignoring and pushing away the voices of other women’s pain, telling herself that she is different and she alone would be loved, safe, and happy, to believing them, holding them by the hand, and finally going back to try and stop the carnage. To me the story of that change, that courage, was the true story of our session. Going into this game, my biggest concern was the balance between the “feminist” and “horror” aspects of its premise. Fall off that tightrope and I feared that only the horror would remain and the worst parts of the genre at that, making a numbing show of violence against women rather than empathizing with their pain. It was the players, not I, who found the answer to this dilemma. Adeline started out fearing and disbelieving the brides in the mansion, insisting that she was different, that she would “win” an unwinnable game by being more pious, more obedient, wiser, and more mature. After witnessing the depth of their pain she finally realized she was just like these women. That they felt the same fear and the same pain, and their fates were inseparable from hers. It was the conversations between the Sisters, veering between fear and hope and a hundred other emotions, that led to this conclusion. These conversations were the heart and conscience of the game. Once I had this insight I realized that my role as Groundskeeper wasn’t just to scare the players or to keep ratcheting up the horror. That may have worked for a different game, don’t get me wrong, but the more sad than frightening final room with the ghosts of the women felt right for that moment and for that particular table. I am not opposed to the concept of showing women’s pain, of course. The house rightfully holds sad and horrific memories of violence, and the Bride would be traumatized for experiencing these memories. My role as Groundskeeper, I came to believe, was to follow the players’ signal and to support them so that they are not numbed by the horror but can feel and empathize with the victims. The change in Adeline as she went from rejection and othering of women’s suffering to empathy and solidarity was a continuing thread in a sometimes difficult session. It was something we could all hold onto, a bond that held us together. Enough of these threads may, in time, weave together into a lifeline that will save us in the end. This entry was posted in In English and tagged Actual Play, Bluebeard's Bride, in english, 실제 플레이, 푸른수염의 신부 on April 3, 2019 by 로키. 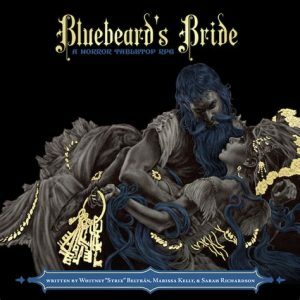 3월 10일 오후 신촌에서 푸른수염의 신부(Bluebeard’s Bride) 플레이를 진행했습니다. 푸른수염의 신부는 옛날이야기의 유명한 아내 연쇄살인범 푸른수염 이야기에 바탕을 두고 있지만, 이 룰에서는 제목처럼 그와 결혼한 신부가 주인공입니다. 남성중심적인 사회에서 여성이 겪는 폭력과 무력감, 그리고 그로 인한 공포를 소재로 다루는 페미니스트 호러물이라고 할 수 있습니다. 시작하면서 제일 먼저 받았던 질문 하나, 플레이어가 4명인데 신부는 몇 명인가요? 답은 한 명입니다! 각 플레이어는 각자 다른 신부가 아닌, 신부의 한 면모, 즉 ‘자매(Sister)’를 맡습니다. 자매들은 결혼반지를 주거니 받거니 하면서 신부의 행동을 통제하며, 결혼반지를 쥐지 않은 신부도 자유롭게 이야기를 나누고 다양한 행동을 할 수 있습니다. 실제로 남편인 푸른수염을 과연 믿을 수 있을지, 저택의 이상한 현상은 남편이 저지른 범죄 때문인지 아니면 전처들이 이상해서 그런 건지 자매들끼리 나누는 대화야말로 플레이의 핵심이었고, 제일 재미있는 부분이기도 했습니다. This entry was posted in 규칙과 배경, 내가 하는 놀이, 소개와 감상, 즉플과 단편 on March 11, 2019 by 로키. 2013년 벤 로빈스 작 킹덤 (Kingdom) RPG입니다. 구성은 다음과 같습니다. 갈림길, 위기, 시간경과 카드의 빈칸은 5인 참가자에 맞춰져 있으니까 참가자가 5인이 안 된다면 원본 .odg 파일에서 빈칸을 편집하시거나 가위표 쳐서 지우고 사용하시면 됩니다. This entry was posted in 규칙과 배경, 창작과 수정 and tagged 요약본, 자료, 캐릭터시트, 킹덤 on February 17, 2014 by 로키. 게시판, 위키 등의 매체로 할 수 있는 PBS (Play by System) 비동시성 플레이를 위한 창작 규칙 ‘실가닥과 실타래’ (To Spin a Yarn)입니다. – 오츠카 에이지의 ‘스토리 메이커’에서 참조한 서사구조를 적용해서 이야기 구조와 완결성을 보완하였습니다. – 이야기 요소와 면모 규칙을 국면 규칙으로 단순화하였습니다. – 글의 구조를 다시 정리하였습니다. – 국면: 설정과 이야기가 쌓이면서 플레이 내에서 확립된 사실입니다. 예를 들어 ‘김리는 도끼를 잘 쓴다’거나 ‘엘프는 오크를 미워한다’ 같은 것입니다. 자신이 글을 쓴 내용을 국면으로 만들고 그 국면 등급을 올리면 (아래 ‘국면 등급’ 참조) 그만큼 반박 과정에서 유리해집니다. 국면에는 크게 초기설정 국면과 서사 국면이 있습니다. 그 차이는 전자는 1.3. 초기설정 과정에서 만들었고 후자는 2.4. 토큰 벌고 투자하기 규칙에 따라 글을 써서 만들었다는 차이뿐입니다. 초기설정 국면의 초기 등급은 1이지만 나중에 글을 쓰면서 등급을 높일 수 있습니다. 국면은 설정 혹은 이야기를 통해 확립된 한 가지 사실을 표현하는 평서문의 형태입니다. 예를 들어 갑과 을이 함께 도둑질을 하면서 친구가 되었다는 글을 썼다면 ‘갑과 을은 친구이다’와 ‘갑과 을은 함께 도둑질을 하였다’는 두 가지 국면을 확립할 수 있습니다. 물론 국면의 범위를 구체적으로 어떻게 설정할지는 어느 정도 주관적이며, 어떠한 사실을 강조할지 하는 판단도 들어갑니다. 예를 들어서 위의 글을 통하여 ‘갑은 전문 도둑이다’와 ‘을은 어쩔 수 없이 갑에게 끌려 도둑질을 하였다’는 내용의 국면을 만들 수도 있습니다. – 국면 등급: 각 국면에는 숫자가 붙는데, 이를 그 국면의 등급이라고 합니다. 국면의 등급이 높을 수록 그 국면을 따르는 글은 반박을 진행할 때 유리한 위치에 있게 됩니다. 국면 등급을 1 올리려면 토큰이 1개 들어가며, 토큰 투자는 설정 단계에 혹은 글을 쓰고 나서 할 수 있습니다. 국면 등급이 높을 수록 해당 국면과 관련된 반박과정에서 유리해집니다. 플레이를 하려면 필요한 것은 다음과 같습니다. 플레이를 위해 위키 등에 다음과 같은 목록을 준비합니다. – 글 제목 목록: 서사구조의 단계 (1.4. 서사구조 참조)에 따라 글의 제목 및 링크 등을 업데이트할 수 있는 목록입니다. – 국면 목록: 초기설정 국면, 그리고 이후 이야기에 따라 만들어가는 서사 국면을 업데이트할 수 있는 목록입니다. 원하면 국면을 종류별로 (설정, 서사, 인물 등) 분류할 수 있습니다. 편의에 따라 이들 목록은 한 개의 게시글에 들어갈 수도 있고, 각각 별개의 게시글에 넣을 수도 있습니다. 모든 참가자는 10 + (참가자 수 * 2) 만큼의 토큰을 가지고 시작합니다. 플레이를 어떤 성격으로 할지 참가자끼리 함께 정합니다. 배경, 장르, 설정 등. 예를 들어 판타지 배경의 검과 마법물을 하자거나, 우주배경의 서부극을 하자거나. 그 외에 1.4.2. 추가 서사요소나 2.6. 즉흥극/RP 기록등 추가 규칙을 사용할 것인지, 기타 즉흥극 기록을 글로 허용시 규칙 사용 여부 등을 내규로 결정합니다. 어느 정도 논의가 되고 나면 가장 나이가 어린 참가자부터 시계방향으로 (온라인상이라면 나이 순서대로) 토큰을 하나씩 내려놓으면서 그 배경 설정을 주어와 서술어를 갖춘 평서문으로 표현합니다. 이는 초기설정 국면으로서, 예를 들면 다음과 같은 것이 있습니다. 모든 초기설정 국면은 등급이 1이며, 글을 쓸 때까지는 등급을 높일 수 없습니다. 즉, 이 단계에서는 새로운 국면 추가만을 할 수 있습니다. 어느 한 참가자가 더 이상 추가할 설정이 없다고 하면 설정 단계는 끝납니다. 전체적으로 모여서 설정회의를 할 시간이 없다면 개별적으로 초기설정 국면을 추가한 후 더 이상 추가할 것이 없는 참가자는 글쓰기 단계로 이행하면 됩니다. 한 번 글을 올린 참가자는 더 이상 글 없이는 국면을 추가할 수 없습니다. 각 단계에는 일정한 요소가 있습니다. 이는 그 단계에 나와야 할 내용으로서, 해당 단계 내에서 나오는 한 요소들 사이에는 순서를 지킬 필요가 없습니다. 또한 한 개의 글에 여러 가지 요소가 나올 수 있습니다. 어떤 글을 써서 서사단계의 요소를 충족할 경우 표시를 해서 지웁니다. 각 단계에 들어가는 글의 총합이 그 단계의 요소를 모두 충족하면 그 단계가 완결된 것으로 봅니다. 완결된 단계에도 글은 계속 쓸 수 있습니다. 예를 들어 조력자와의 만남과 같은 요소가 조력자별로 반복될 수 있습니다. 기본 서사구조는 아래 1.4.1.에 나오는 ‘영웅의 여정’이지만, 자유롭게 수정하거나 다른 구조를 사용해도 무방합니다. 다음은 ‘영웅의 여정’을 참조한 서사구조를 이루는 각 단계입니다. 여기 나오는 여정은 물리적일 수도 있고 (납치당한 공주를 구하는 모험), 정신적·사회적일 수도 있습니다 (전학생이 새 학교에 적응하는 과정). 서사구조에 더해 구조 속의 어느 한 단계에 반드시 나타나야 하는 것은 아니지만 인물의 변화와 동기, 특정한 질문에 대한 답 등 추가적인 서사 요소를 추가로 요구할 수 있습니다. 예를 들어 인물의 특정한 문제나 부족한 점이 해결되는지 (부자는 탐욕에서 벗어나는가? ), 특정 수수께끼가 해결되는지 (공작을 살해한 것은 누구인가?) 하는 요소를 추가해서 이러한 요소가 이야기 중 해소되어야 플레이를 종결지을 수 있다고 정할 수 있습니다. 위 ‘영웅의 여정’ 서사구조의 경우 인물성을 추가로 보완하는 목적으로 다음과 같은 추가 서사요소를 넣을 수 있습니다.특정 서사단계의 요소와 마찬가지로 이러한 요소를 표현한 글을 쓴 다음에 표시해서 지우면 됩니다. 이들 요소는 특정 단계에 나올 필요는 없지만 플레이를 종결하려면 글을 통해서 충족하여야 하는 요소입니다. 인물과 관련된 요소는 필요에 따라 해당 인물의 수만큼 늘릴 수 있습니다. 예를 들어 주인공이 여러 명이라면 각 주인공마다 관련 요소를 만들면 됩니다. 글을 쓰는 것은 ‘실가닥과 실타래’의 놀이 방식의 기본입니다. 글을 통해 참가자는 플레이 내에서 무슨 일이 벌어지는지 서술합니다. 글에는 어떠한 인물이나 배경 요소도 등장할 수 있으며, 새로운 인물, 아이템, 설정 등을 자유롭게 만들 수 있습니다. 다만 이미 설정된 국면에 반대할 경우 반박당하기 쉽습니다. 글이 이상하다거나 다른 참가자가 글의 내용을 마음에 들어하지 않을까 걱정할 필요는 없습니다. 다른 참가자가 글이 마음에 들지 않으면 반박 규칙을 사용해서 원래 글을 수정하거나 삭제할 수 있으니까요. 물론 그런 반박을 미연에 방지하는 의미에서 다른 참가자와 미리 협의를 거쳐 조율할 수 있으며, 또 등급이 높은 국면을 따르는 글을 써서 반박에서 유리한 위치를 차지할 수 있습니다. 글의 형태는 소설이 일반적이겠지만 등장인물 시점에서 쓰는 일기 형식일 수도 있고, 그 외에도 극본, 시, 편지 등 다양한 형태일 수 있습니다. 내규로 제약하지 않는 한 형식은 제약이 없습니다. 글은 이야기 순서대로 쓰지 않아도 됩니다. 결말부터 쓸 수도 있고, 누군가 결말을 쓴 다음에 발단 부분을 써도 됩니다. 다만, 가능하면 편의를 위해 글을 이야기 순서대로 글의 제목이나 링크를 배열한 목록을 유지하는 것이 좋습니다. 글을 쓸 때는 서사 단계를 하나 골라서 그 단계에 넣습니다. 예를 들어 ‘모험에의 부름’에 해당하는 글은 발단 항목 밑에 넣고, ‘귀환’에 해당한다면 전개 항목에 넣으면 됩니다. 글을 올리면 토큰을 3점 받으며, 국면 등급에 최대 2점까지 토큰을 투자할 수 있습니다. 토큰은 분산 투자할 수 있으며, 2점까지 투자할 수 있을 뿐 반드시 투자해야 하는 것은 아닙니다. 토큰을 투자해서 자신이 쓴 글에 맞는 국면을 새로 만들 수도 있고, 기존 국면의 등급을 높일 수도 있습니다. 자신이 쓴 글이 해당 서사단계의 기존에 비어 있었던 요소를 충족한다면 해당 요소 옆에 체크를 합니다. 예를 들어 □ 표시를 ■ 표시로 바꿔서 표시할 수 있습니다. 참가자 둘 이상이 등장 인물의 역할을 맡아 하는 즉흥극 기록, 예를 들어 채트 로그나 음성 녹음, 영상 등을 게시할 수도 있습니다. 만약 RPG 규칙을 사용하고 싶은 경우 RPG 세션으로 진행해도 좋습니다. 구체적인 사항은 플레이 협의 중 내규로 정합니다. 역할극 기록을 글로 올릴 때에는 총 참가자 수와 상관없이 각 참가자가 토큰을 1점씩 받으며 (게임마스터가 있었다면 마스터는 2점), 각자 최대 3점까지 토큰을 국면에 투자할 수 있습니다. 기존의 글 내용이 마음에 들지 않거나 글 내용을 고치고 싶다면 그 기존의 글과 충돌하는 글을 쓰거나, 그 기존의 글을 일부 수정할 수 있습니다. 반박 절차는 다음과 같습니다. 우선 반박하는 대체글을 쓰거나 반박하려는 글을 일부 수정 요청합니다. 반박글을 쓰는 것은 반박하고 싶은 기존 글과 전혀 다른 내용으로 글을 대체하고 싶을 때 유용하고, 기존 글을 일부 수정하는 방법은 일부 내용만 대체하려고 할 때 유용합니다. 예를 들어 댓글을 달아 인물의 대사나 행동 한두 가지만 수정할 때가 그 예이겠지요. 반박글은 글쓰기의 일반 규칙을 적용합니다. 따라서, 글로 쓴다면 토큰 3을 벌고 토큰을 2점까지 투자할 수 있으며, 2.6. 추가 규칙을 사용한 RP 기록이라면 각자 토큰 1점 (마스터는 2점)을 벌고 3점까지 투자할 수 있습니다. 반박 수정은 새로 글을 쓰는 것이 아니므로 토큰을 벌지도 못하고, 플레이 요소나 면모에 투자할 기회도 생기지 않습니다. 대체하는 반박글을 제시하지 않고 글 자체의 삭제를 요구하는 것도 반박 수정의 한 종류입니다. 반박자는 토큰을 최소 1개 반박에 겁니다. 이 토큰은 바로 내는 것은 아니며, 앞으로도 낼 일이 없을 수도 있습니다. 이 토큰은 반박의 내용이 반박자에게 얼마나 중요한지 나타내며, 반박당하는 글의 저자가 반복을 뒤집는 어려움의 정도이자 반박이 뒤집히면 반박자가 잃을 토큰이기도 합니다. 반박의 내용이 사소한 수정이라면 토큰 1~2개 정도가 적당하겠지만, 플레이 전체의 방향을 바꿀 만큼 중대한 차이가 있는 반박글이라면 토큰 10개도 충분히 걸 수 있습니다. 원본 글에 반박을 알리는 댓글을 답니다. 반박의 근거가 되는 서사 국면과 반박에 걸 토큰의 수도 함께 적습니다. 반박글 방식으로 한다면 본인의 글을 링크하거나 제목을 적고, 반박 수정 방식이라면 어떤 부분에 수정을 요구하는지 적습니다. 이 단계에서 반박 혹은 피반박자를 도와줄 참가자는 토큰을 몇 개나 도와줄지 역시 댓글로 적습니다. 반박당한 글을 쓴 원저자, 피반박자는 반박에 승복하거나 반박을 뒤집을 수 있습니다. 그 단계는 다음과 같습니다. 반박을 뒤집으려면 반박을 뒤집겠다고 댓글을 단 후 그 근거가 되는 서사 국면을 제시합니다. 피반박자는 다음 공식으로 구한 수만큼 토큰을 냅니다. 만약 잔여 토큰이 그만큼 없다면 반박을 뒤집을 수 없습니다. 피반박자가 토큰을 성공적으로 내면 반박자 및 그 조력자도 걸었던 토큰을 냅니다. 만약 반박자 토큰의 잔액이 부족하다면 반박자의 토큰 잔액을 마이너스로 내려서라도 반박에 건 토큰 수를 채웁니다. 이것은 토큰 잔액이 음수로 내려갈 수 있는 유일한 경우로, 토큰 잔액이 0 이상이 될 때까지는 토큰을 어디에도 투자할 수 없습니다. 3.6.의 반박 판정에서 승리한 글이 플레이의 진실이 됩니다. 이렇게 진실이 된 글에 모순되는 글은 반박 절차를 거치지 않고도 수정이나 반박글을 통해 반박할 수 있습니다. 반박된 글만을 근거로 하는 국면은 삭제됩니다. 근거가 된 글이 모두 반박된 국면 역시 삭제됩니다. 모든 서사 단계를 완결하였고 각 단계에 글이 적어도 하나씩 있다면 놀이를 종결할 조건이 갖추어집니다. 어느 한 참가자가 종결을 하겠다는 공지를 올리면 다른 참가자들이 종결 조건이 충족되었는지, 아직 마무리가 안 된 부분이 있는지 댓글을 올립니다. 아직 마무리가 안 된 부분이 있다면 어떠한 부분이 필요한지, 그리고 언제까지 쓸지 정해서 마무리를 위해 필요한 글을 올리고 플레이를 마칩니다. This entry was posted in 규칙과 배경, 창작과 수정 and tagged 규칙, 실가닥과 실타래 on January 6, 2014 by 로키. 지난 10월 2일 폴라리스 후원 종료는 끝이 아닌 새로운 시작이었습니다. 폴라리스 일도 물론 많아졌지만 또 그 이후의 계획을 세우고 정진할 시간이기도 합니다. 그간 받은 성원은 폴라리스 출판을 위한 것이기도 하지만 동시에 ‘이야기와 놀이’를 위한, 그리고 한국 RPG를 위한 채찍질로 알고 좋은 폴라리스 룰북, 그리고 앞으로도 좋은 컨텐츠를 들고 찾아뵙겠다는 결심을 더욱 다지는 계기가 되었습니다. This entry was posted in RPG계, 소식 and tagged 텀블벅, 폴라리스, 한국 RPG on October 5, 2013 by 로키. This entry was posted in 소식 and tagged 텀블벅, 폴라리스 on September 1, 2013 by 로키. 준비할 시간은 1개월이 넘게 있었는데 내가 그렇지 뭘 어느덧 제12회 일일플레이가 일주일 앞으로 다가왔습니다. 읭? 난 준비가 안 됐는데? 그래도 일주일이면 길다면 긴 시간이겠죠. 원래 마스터링 준비는 제 약점인 만큼 이번에는 체계적으로, 그리고 더는 미룰 수 없도록 공개적으로! 준비를 해보기로 했습니다. 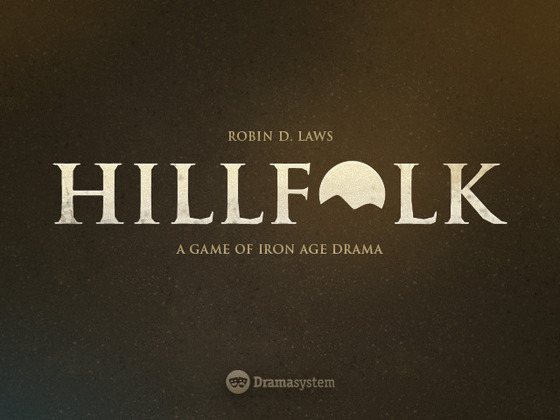 하려는 시스템은 RPG 디자이너이자 이론가인 Robin D. Laws 씨가 준비중인 신작 Hillfolk입니다. 킥스타터 후원을 한 위시송씨를 통해 미리보기 PDF판이 있어서 한 번 해보고 싶어졌지요. 인물 간의 인간관계와 감정적 욕구를 중심으로 진행하는 점, 감정적 균형을 나타내는 극적 판정은 참가자 간의 흥정과 자원관리로 하고 그 외의 절차적 판정은 위험과 이득 사이를 저울질하는 방식으로 한 점이 마음에 들었거든요. 준비는 다음과 같은 단계로 하기로 하였습니다. This entry was posted in 놀면서 든 생각 and tagged 마스터링, 유비무환, 일일플레이 on February 11, 2013 by 로키. $2 서버에 접속할 수 없을 때 흔히 벌어지는 현상입니다. IRC 서버 접속이 잘 되는지 확인해보시고, 해결이 안 되면 댓글로 알려주세요. 파이선으로 만든 IRC용 주사위 로봇 “우트가르드 로키”입니다. IRCBot 모듈을 기반으로 했으며, 실행 파일은 py2exe로 pyInstaller로 만들었습니다. 이전 mIRC 스크립트와는 달리 mIRC에 의존하지 않으며, 닉과 서버를 정해서 실행시킨 후 채널에 초대하는 방식입니다. utgard_loki.exe 실행파일을 편하신 폴더에 받으시면 됩니다. 이 실행 파일은 윈도우뿐 아니라 맥과 리눅스도 된다고 들었는데, 직접 테스트해보지는 못했습니다. 실행하시려면 이 파일을 더블클릭하세요. 파이선 해석기가 있으신 분은 utgard_loki.py 모듈을 받아서 사용하셔도 됩니다. 코드를 보거나 수정하시려면 이 모듈로 하시면 됩니다. 원래 출처를 밝히시고 코드 상단의 프로그램명과 저작권 정보를 삭제하지 않으시면 수정과 재배포는 얼마든지 괜찮습니다. 접속하려면 utgard_loki 파일을 실행시킨 후 닉 (예: 우트가르드-로키)과 서버 (예: irc.hanirc.org, irc.dankun.net 등)를 지정합니다. 뭔가 글자가 무진장 많이 지나갑니다. 서버 접속 메시지가 떴으면 필요한 채널에서 관리자가 주사위 로봇을 초대하세요. (예: /invite 우트가르드-로키 #국가의건설) 접속을 끊으려면 프로그램을 끄거나 파이선 셸을 초기화하면 됩니다. 하는 식으로 채널이나 로봇에게 귓속말로 쳐주면 됩니다. 채널에 입력하면 공개 굴림이 되며, 귓속말로 하면 비밀 굴림이 됩니다. 주사위 지정은 첫 단어에만 반응하며, 수정치는 한 칸 떼어주세요. 등등. 주사위 갯수는 지정이 없으면 1, 면수는 지정이 없으면 6입니다. 하는 식으로 적어주면 됩니다. 정렬과 수정치 기능은 동시에 발동하지 않습니다. 정렬과 수정치가 둘 다 있으면 정렬만 적용합니다. This entry was posted in 스크립팅 and tagged RPG&Tech on June 1, 2012 by 로키. IRC용 트럼프 카드 스크립트, 음.. ‘카드군’입니다! 취향대로 카드냥, 카드씨, 마담 카드 등등. 적당한 곳에 압축을 풀고 단일 파일인 cards.exe를 실행합니다. 파이썬 해석기 (Version 2.7입니다)를 통해 cards.py로 실행하시려면 utgard_loki.py를 같은 폴더에 놓고 실행하시면 됩니다. 닉과 서버 입력하라는 얘기가 나오면 카드 로봇이 사용할 닉 (예: 카드군)과 들어갈 서버 (예: irc.hanirc.org)를 입력합니다. 닉이 겹친다는 소리가 나오면 그냥 콘솔을 꺼서 연결 해제하고 새로운 닉으로 다시 시도하시길. 다음, 같은 서버에서 원하는 채널에 초대합니다. 사용하려면 카드로 시작하는 명령어를 입력합니다. 카드를 섞으라고 말하면 카드를 섞습니다. 카드 관련 정보를 알려달라고 하면 덱에 카드가 얼마나 남았는지 알려줍니다. 재밌게 사용하시길~ 버그나 문제 있으면 알려주시고요. This entry was posted in 스크립팅 and tagged RPG&Tech, 트럼프 카드 on June 1, 2012 by 로키. 매번 카페에서 시트 찾기 귀찮아 링크를 이곳에 겁니다. This entry was posted in 마우스가드 1154 and tagged 마우스가드, 캐릭터시트 on April 8, 2012 by 로키.